SINGAPORE - A total of 8,940 new flats were launched for sale on Tuesday (May 24) by the Housing Board (HDB), including some in the sought-after mature towns of Ang Mo Kio and Bedok. The launch comprises 3,770 Build-to-Order (BTO) flats and 5,170 balance flats. Of the BTO flats, experts expect the two projects in Ang Mo Kio and Bedok to be most popular. Ang Mo Kio Court offers 590 flats, comprising 156 two-room flexi units, 234 four-roomers, 148 units five-roomers and 52 Three-Generation (3Gen) flats for multi-generational families. Bedok North Woods offers 357 flats, comprising 110 three-roomers and 247 four-roomers. Instead, he encouraged young couples to apply for BTO flats in non-mature estates, which are generally more affordable and come with more grants. “By opting for a three-room flat in Sembawang instead of one in a mature estate like Bedok, you get to save more than $100,000 instantly, which you could set aside for renovation and more. You will also enjoy a much higher chance of success in your application,” he said. He acknowledged the perception that flats in non-mature estates are located far from jobs and are not as well served by transport or other facilities. “But there are significant development plans in many of these areas, which potential home buyers should take into consideration,” he said. 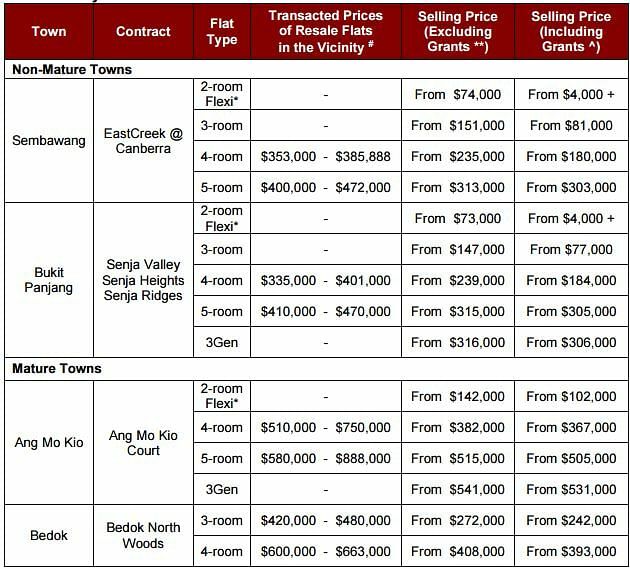 Another 1,571 BTO flats are being offered across three projects in the non-mature town of Bukit Panjang, and 1,252 flats in Sembawang's EastCreek @ Canberra project. These range from two-room flexi to five-room flats, with 62 3Gen flats also available in Bukit Panjang. It was previously announced that BTO flats would also be offered in the mature town of Bukit Merah during this May sales exercise. However, the project "is undergoing further review, to better integrate the project with the surrounding developments", said the HDB. The project will be launched after the review is completed. The BTO launch takes place alongside a Sale of Balance Flats exercise, with 5,170 flats across 14 mature and 11 non-mature towns. These comprise 900 two-room flexi units, 1,070 three-roomers, 1,942 four-roomers, 1,168 five-roomers, 77 3Gen flats and 13 executive flats - a flat type which the HDB no longer offers in new projects. This sales exercise also marks the start of greater priority for second-timer families in public rental flats. They will now be included in the Tenants' Priority Scheme, which sets aside 10 per cent of two-room flexi and three-room flats for families in public rental flats, as well as those applying under the Selective En bloc Redevelopment Scheme, Relocation and Resettlement. Tuesday's BTO and SBF launches, which close next Monday (May 30), bring the total number of new flats offered so far this year to 13,110. At the next sales launch in August, about 4,810 BTO flats will be offered in the non-mature estates of Hougang, Sembawang and Yishun, and the mature estate of Tampines.